Where Lighters can be shaped like anything! < < < < < Welcome to Lightersville I have been collecting lighters for years now, but it was only recently that my collecting addiction has giving me time to focus on collecting lighters ( I collect tea pots, coins, etc.). I thought it would be fun to share my collection and the process of collecting with this blog. 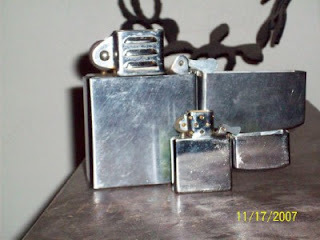 My favorite type of lighters are the novelty lighters, however I will accept any kind of lighter into my collection! Shortly after bringing me the alien lighter that same friend brought me this big zippo like lighter. I say zippo like because it does not say it is a zippo. Standing at almost 5 inches tall, it towers over a standard size zippo lighters. 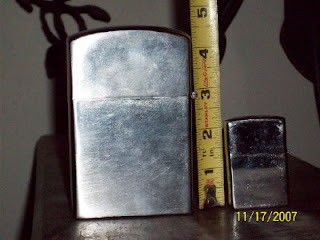 It is the perfect size for a man with big hands,lol, and a perfect edition to my new lighter collection. I would of gotten a picture of it lit but I keep it empty, for safety reasons. It has a tendency to burst into a ball flames when it is lit. the seal where the fluid goes it not to good and it leaks out. It could really scare someone that was not expecting it to burst into flames.lol. Maybe, when I get some fluid I will get a video of it on fire ( while someone else holds it,lol). Singing Alien- "its a small world"
directories and links pages Free. Boost your website's traffic fast!! !